Shortly after the 2018 draft ended, the Cubs signed 3 non-drafted free agents. Two of them were catchers, which is pretty common. 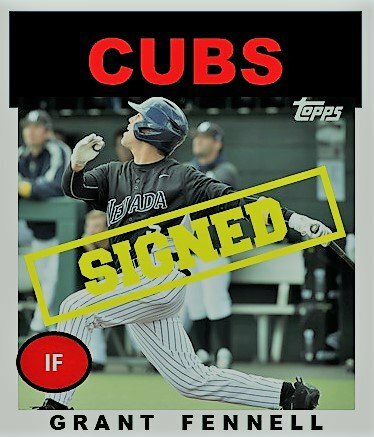 The other was utility player Grant Fennell comes from the University of Nevada, which is in the Mountain West Conference. Fennell earned the Player of the Year honor in 2018 after he hit .389 with a .466 OBP. He only hit 5 HRs and also drove in 52 in 51 games in his senior year. One has to wonder why no one selected him in the draft? However, everyone else’s failure turned out to be a lucky thing for the Cubs. 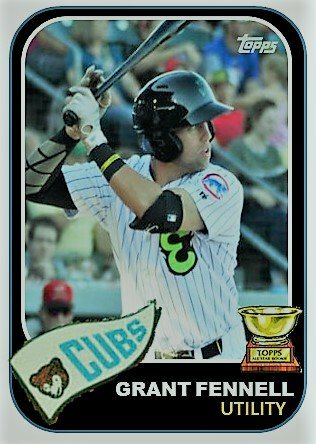 Eugene manager Steve Lerud played a big role in the Cubs signing Fennell. Lerud recommended the Cubs’ scouts should take a look at Grant. They did, they liked what they saw, and they signed the undrafted utility player. He began his pro career in Mesa and did very well there hitting .355 with 1 HR and 19 RBI in 20 games. On Wednesday morning, I released the July All-Star team for the Cubs minor-league system. Firmly implanted in the outfield was Grant Fennel (pronounced Fuh-nell). So far, since his signing, Fennell has hit .331 with an OBP of .375 along with 3 home runs with 28 driven in between Mesa and Eugene in 36 games. Considering that his first week in Eugene was not very good, his second week and beyond have most certainly picked up the pace. Heading into Wednesday night, I had only caught four games of Fennell on MILB.TV as Eugene is one of only two teams that broadcast their games in the Northwest League. He did not look good in those first few games I saw as he went 3-for-15. However, it was on the road that he began to take off. Over the next five games, Fennell went 8-for-20. When it was over, I was excited to see how he looked when he is going well. As the Emeralds opened their home stand, I decided it would be a perfect time to take a closer look at what he can do. 1. Fennell has a nice short quick stroke that will allow him to react quickly. His swing remains fluid and can adapt to pitches as it is not very mechanical. He also hits to all fields with right field receiving over 40% of his batted balls. 2. Fennell is also a decent athlete. He hustles on every play, whether he is in the field or on the base paths. 3. He squares up strikes. I like to see this in a hitter. A pitcher should be afraid to throw him strikes. Instead, pitchers are already trying to get Fennell to swing at something out of the zone. The first time he sees a breaking ball, he can easily be fooled. 4. K/BB Percentage: His walk percentage is a very low at under 4% while his strikeout percentage is very high at almost 27%. Those two things need to flip-flop or, at the minimum, be much closer to each rather than a 23+ percentage point separation. 5. He adapts well from at-bat to at-bat and even within at-bat. The more he sees the pitcher, the better off he is. Currently. he sees right at four pitches per at-bat. The third time he sees a guy, he tends to destroy the baseball. Take this cremation of a baseball as exhibit #1. It was the second time he saw this kid’s breaking ball in the at-bat and Grant got after it. Notice his quick bat. 6. Defense – You would think in three games, that I would get a good look at his throwing arm. It didn’t happen. He’s only had 17 chances in left in his eleven games in Eugene. 7. Positioning – He is playing mostly LF for Eugene. He did play 6 games at 1B in Mesa and one at 3B there. As for his place in the batting order, he’s hit from first through sixth in the order with most of his success coming from batting first or second. His OPS in those positions are outstanding at 1.077 and 1.083 respectively. Like most prospects, evaluating them fully can’t be done in a week, let alone three games. It takes multiple viewings in multiple settings. For now, though, there’s a lot to like about Fennell. He still needs to work on his pitch recognition skills and get his K rate down. Then again, there’s a lot to build upon and be thrilled with right now. The ability to hit the ball hard in key situations is critical. Fennell comes across as a very focused and driven player. It is going to be fun to watch him develop his hitting skills the next few years. ‹ PreviousProspect Update: Is D.J. Wilson Turning a Corner?